A.G. Rubinstein with the aim to communicate with the fans of his music, and to share rare recordings between each other. I have written rather intersting review of his main works in my native language (Russian). Perhaps I will find people who can help me to translate this information for the forum. I'm still in proccess because most of his music is not recorded. I have to admit I know very little about Rubinstein. For many years the only piece I knew was an orchestral version of one of Kammeniy-ostrov. A few years ago I downloaded a free app onto my tablet and it contained several works by Rubinstein including the complete Kammeniy-ostrov played by Joseph Banowetz; I believe the recording is Russian in origin as some of the metadata is in the Cyrillic alphabet. I also saved the Ocean Symphony from the app and transferred it to my PC; I still haven't got round to listening to all of it but will do shortly now your posting has prompted me. Thank you. Is it alloweded to post here links to full recordings in mp3, like I have made it with clips in the first post? I have some unpublished recordings made from concerts, radio and so on. I actually quite like his "Dramatic" symphony. I rather like the brooding,slightly mysterious atmosphere of it's best moments. The fact that it doesn't sound specifically Russian doesn't bother me. I think I'm about the only person in the world who enjoys it,though! I also rather like his "Ocean" symphony. I remember getting the old Turnabout recording,from the local library,and enjoying it. As far as I can make out the recording has never been reissued on a cd;which is a pity. I think his First symphony has got it's good points,too. I used to post on the old,defunct Chandos forum about the these symphonies;hoping I could persuade them to record one or two! I think they were probably bemused;that's if they took any notice at all?! Rubinstein's compositions get such a bad rap (with his opera,The Demon,a notable exception) that they probably thought,"Who's this nutbag who wants us to record Rubinstein symphonies?!" But if labels like Hyperion and Chandos can record symphonies by composers like Raff or Spohr;why not Rubinstein? I'm sure some members here will give me a good reason,though?!! The complete cycle of symphonies is available on the Naxos,and Marco Polo labels (secondhand),of course. I just think they would benefit from better performances and sound. Howard Griffiths' Cpo recordings of Spohr symphonies,for example,really turned me into a bit of a fan after those okay,but workmanlike Marco Polo recordings in thin,undernourished sound. 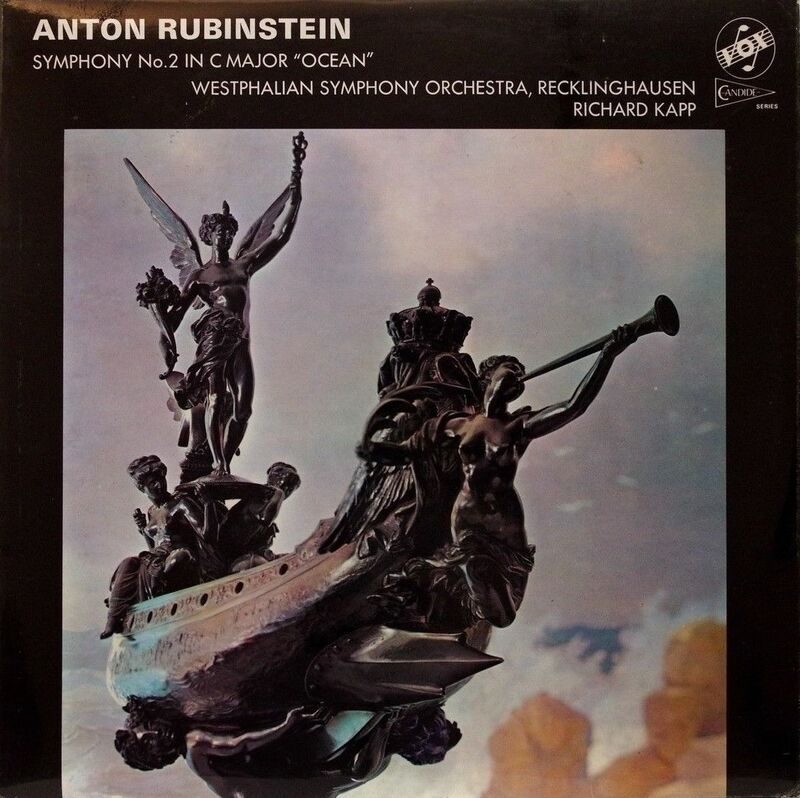 Rubinstein is a composer I always want to like more than I do after listening to a work by him. On paper they should be great; big boned Romantic, sweeping melodies, passionate climaxes. What I hear seems so much less exciting than that. I've tried the complete 7 movement version of the Ocean Symphony as well as the oddly curtailed 4 movement version - & I'm not sure I've ever heard as undramatic a work as the Dramatic Symphony! But you are right - perhaps a well-engineered, played to the hilt recording would drop the veil from my ears! - 22 years old. It's the same if you begin to study Beethoven and choose for that 1st Symphony. If you like symphonies try to listen his 5th Symphony it is named "Russian". It's a masterpiece. You can listen it here (this recording dates to 1987), conductor Valentin Zverev, Large symphony orchestra of Central Radio and TV, Russia from LP. I only know the 'Ocean' Symphony and didn't like it very much - so this advice is interesting and I'll look out for Symphony 5. Hi, I have added great recording of it in the previous post. I think it's legal because this recording is also can be downloaded from memorial site of this musician (V.Zverev - in Russia he is known mostly as flutist). Tchaikovsky and his teacher Anton Rubinstein were the main composers in Russia in 19 century. I find that it is true and today, but most of Anton's music is unknown today. Hi Dima, I see you are new here, so welcome. It is interesting to have someone from Russia who can report on the music scene there. I wanted to refer to your comment about Tchaikovsky and Anton Rubinstein. Is it really true that they were regarded more than Glazunov, Glinka, Cui, Borodin, Moussorgsky, Rimsky-Korsakov, Balakirev, in what I presume is the late 19th century? Is it really true that they were regarded more than Glazunov, Glinka, Cui, Borodin, Moussorgsky, Rimsky-Korsakov, Balakirev, in what I presume is the late 19th century? I think the answer depends on where you'd have asked this question back then: in Moscow or in Saint-Petersburg. Yet I'm sure Glinka was venerated in both locations. If you like symphonies try to listen his 5th Symphony it is named "Russian". It's a masterpiece. Thankyou Dima for the link and the recommendation - greatly appreciated. I will enjoy listening to this! I have not mentioned the name of Glinka as a God of Russian music and for most russians. The second one after Glinka in the development of russian music was Anton Rubinstein. Tchaikovsky (composer number one in the world in my view) was not only a student of Rubinstein he was stylistically the follower of Rubinstein. Every big work of Rubinstein infuenced Tchaikovsky music. Anton Rubinstein was a jew, it was a shame to be jew in Russia in these time but Rubinstein had good communications with Tsar family, for these reasons after Bolshevik revolution in 1917 everything that was devoted to him was neglected. It was ruined memorial on his grave, his house was not saved. The notes does not published and it was published only bad reviews on his compositions so on. And after everybody succesfully forgot about him, the first Russian conservatory (in Sanct-Petersburg) that Rubinstein opened on own money was named not after Anton Rubinstein, but after Rimsky-Korsakov. Situation does not change till our time but I hope it will be changed one day because (question you ask me) he really one of the great composers. You can see the photo of memorial on the grave of Rubinstein how it was and today. I have not mentioned the name of Glinka as a God of Russian music and for most russians. The second one after Glinka in the development of russian music was Anton Rubinstein. Tchaikovsky (composer number one in the world in my view) was not only a student of Rubinstein he was stylistically the follower of Rubinstein. Every big work of Rubinstein infuenced Tchaikovsky music. Anton Rubinstein was a jew, it was a shame to be jew in Russia in these time and also Rubinstein had good communications with Tsar family, that's why after Bolshevik revolution in 1917 everything that was devoted to him was neglected. It was ruined memorial on his grave, his house was not saved. The notes does not published and it was published only bad reviews on his compositions so on. And after everybody succesfully forgot about him the first Russian conservatory (in Sanct-Petersburg) that Rubinstein opened on own money was named not after Anton Rubinstein, but after Rimsky-Korsakov. Situation does not change till our time but I hope it will be changed one day because he (question you ask me) just one of the great composers. Sorry, but this is rather incongruous. It was shameful to be a Jew, yet somehow a Jew (Rubinstein) was well-connected to no less than the Tsar's family... What am I missing here? I think it has been said,more than once,that calling it the "Dramatic" was a mistake on Rubinstein's part. According to the booklet with my Russian Disc cd,it caused a good deal of debate at the time. Rubinstein's insistence on remaining "tight lipped",didn't help! Maybe he would have been better of not giving it a name? Anyone who listen's to it is obviously predisposed to expect something dramatic. Even if it's well orchestrated and moderately melodious they are going to be disappointed in some way. Of course,maybe you just think it is dull? But maybe it raises expectations a little too much? I have heard all six symphonies,though;and I prefer No's 4,2 & 1 to No 5 (in that order)the latter, supposedly,sounding more specifically Russian (as is,No 6),which,it does. Although,not as brazenly Russian as Borodin or Tchaikovsky,of course! Incidentally,I just had a look at some reviews of these symphonies on the internet and some of the responses I found were less negative than I expected. Some quite positive. This one (see below) very enthusiastic indeed!! (Tchaikovsky,a "minor" composer,though?!! He's not one of my favourite composers,but.....................?!!! ) Fellow critic,Nick Barnard evidently disagrees! I would, personally,welcome a really top notch cycle from Cpo,or some such label,though! Although,I don't know if it would change my opinion of some of them? The recording quality on those Marco Polo and Russian Discs really could be improved upon;and lush sweeping strings are a "must" in repertoire of this kind,imho! You think logical, but there is russian tradition: when Jews (and not also Jews) are needed - they are rewarded, and when they do not needed - they can be smashed. It's interesting but Tchaikovsky even composed little composition for chor in owner of Rubinstein with words: "Anton you are not an alien".